MANHATTAN, N.Y., Nov. 7, 2017 /PRNewswire/ -- Tattle Inc., a Customer Experience Management (CXM) platform, is proud to announce its partnership with Au Bon Pain (ABP). Starting today, ABP will be begin launching across its corporate and franchise cafés in order to collect direct and private feedback from their guests to more effectively measure their retail and digital ordering performance. ABP aims to utilize the Tattle platform in order to cultivate an expansive guest-centric culture by using multi-channel feedback to build stronger guest relationships, prevent customer detraction through guest recovery responses, empower GMs to make smarter operational decisions, and improve per-unit sales. Guests submit onsite and digital ordering feedback through Au Bon Pain's branded survey link to drive 20-50X greater feedback volume than alternatives and a near perfect survey completion rate where over 90% of feedback comes from within a .5-mile radius of each ABP café. "We are always seeking innovative ways to gather the highest volume and most insightful sentiment data directly from our guests and we've found that with Tattle," says Marty Ritson, COO of Au Bon Pain. "After testing a number of other platforms, Tattle is the best survey platform we've used. No other platform has offered the ability to measure our key pillars of 'clean, fast, and friendly' with the level of statistical relevance that we've experienced through Tattle. For both the executive team and our GMs, it is incredibly easy to get the information we need, view it in the dashboard, and respond back to guests. We're excited for the system-wide launch across our cafés as the feedback data point at this volume can finally serve as the foundation of many operational processes in the future." Completing the customer journey with mobile-first guest feedback helps businesses to make smarter operational decisions and improve the customer experience in real-time. By empowering guests to communicate with businesses while they are onsite or through digital ordering platforms, Tattle is extracting 20–50X more data wherever guests transaction and putting it in the hands of its partners to fix problems that arise, make smarter operational decisions, and drive per-unit revenue. 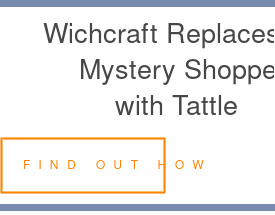 Interested in learning more about how you can use Tattle? Contact us here! Based in New York City, Tattle is a full Customer Experience Management platform that helps brands build customer experience and feedback infrastructure by empowering guests to communicate across onsite and digital ordering channels. By generating significantly greater feedback volume, Tattle helps to reduce customer detraction through guest recovery strategies, identify trends to help teams make smarter operational decisions, prevent negative reviews from reaching public review forums, and improve revenue and per unit sales.